Q. How soon can you get to our home? Often we are at the job site within an hour or two from the time of a request. Of course we can also schedule to be there at just about any time that works for you. Our technicians leave our warehouses, fully loaded with the most common sizes of water heaters and every conceivable part, and travel from job to job. They use Nextel communications to stay connected to the main dispatch office at all times. Q. What considerations do you suggest looking at when sizing a replacement water heater? Is your need for hot water growing, staying about the same, or diminishing? Is it possible that your present heater seemed undersized due to a build-up of sediment in the bottom? Are you planning on moving in the near future, and if so, what size might a prospective buyer expect in your size home? Does it ruin your day when you run out of hot water or is it just a minor inconvenience? Are you willing to space your shower and laundry usage to avoid running out of hot water? How important is energy conservation to you? Q. Is one brand of water heater better than another? There is no simple answer. Over the past 10 years we have purchased all major brands and have a good feel for quality. Sometimes a brand will improve in quality or slip a little and we act accordingly. Due to changes in construction often mandated by government energy laws, models have changed frequently and with the new technology can come some problems which often need to be worked out. Q. I’ve heard of anodes, what are they and are they important? Anodes are “sacrificial” rods which hang down inside the tank from the top. Yes, they are important. Without them the tank might last just a year or two. Some people go to the trouble of changing anodes every five years or so which can extend the life of the heater almost indefinitely. We suggest considering size and number of anodes when shopping for a new heater. Some heaters have twice the protection of others and not necessarily at a higher price. Q. My pilot isn’t staying lit, do I need a technician? Most people don’t feel comfortable attempting to repair the most common problems related to these symptoms. One can attempt to change out a thermocouple themselves but considering the guesswork, necessary tools, and time required most people choose to have a technician do the work. Q. Is there a way to get water faster at my shower or kitchen? Often “ranch style” homes in particular have very long runs of piping between the water heater and the furthest fixtures. It is common for us to create a loop in a system like this by placing a tee fitting where a 90 degree elbow is removed out under that furthest bathroom and then running a return line back to the water heater location. In this loop we install a circulating pump with a temperature control device and then insulate the entire loop. This system adds a little volume to your standing hot water reserve and saves on water, since water doesn’t have to run so long to heat up. The control can also have a timing device which activates the circulating system only during a time period when you typically shower or use the dishwasher, thus saving the cost of running 24/7. Q. Are tankless or “on demand” water heaters a good alternative to my conventional water heater when mine needs replacement? It depends on you and your situation. Tankless heaters cost a considerable amount more than conventional heaters in general and they may save you in energy costs, but not always. Some units only adequately supply one or two fixtures operating simultaneously so a home might require a large unit or more than one heater. If you are considering the installation of a large sitting bath or similar fixture it might be a good choice or if you are interested in creating more free space it might be a good alternative. Often they require a larger gas line than is close by and the flue piping up through the roof must be of an approved type and size. Federal tax credits can make the choice a little less costly. Q. My heater makes a “rumbling” noise when the burner is on, is this an issue that I should be concerned with? The noise described as “rumbling” usually is the sound of expanding heated water escaping from sediment at the bottom of a tank. This situation is not dangerous but it is a sign that the heater has lost much of its efficiency. As sediment builds up, more and more heat is wasted up the chimney and less gets into your water. The overheating of the bottom of the tank also shortens the life of the tank. Q. Can I clean sediment from my heater? Some areas are notorious for “bad” water and in these areas flushing the water heater can extend its life and save on energy costs. Once sediment is allowed to build up and solidify it can be almost impossible to remove from residential model heaters. It is similar to coral. To prevent this solidification, a homeowner can flush the heater periodically by placing a bucket (preferably colored) under the drain valve and opening the valve long enough to fill the bucket. Do not turn the incoming water off; you are not draining the heater but flushing it and the pressure is necessary to clean out the loose sediment. If you let the bucket with the water sit an hour or so and then look to see if there are any light colored particles at the bottom you will get an idea if your effort was meaningful. The amount of sediment particles in the bucket might be a clue as to how often you should repeat the procedure. We suggest recording the dates on the heater. Q. I would like to use the water heater closet for towels and other things; can the heater be moved elsewhere? We commonly relocate water heaters, most often to metal enclosures made just for that purpose. People love to free up that space for other things. Housing construction costs at over $200 per square foot a person could say that your interior closet space, if it is 3′ x 4′, would be worth about $2400. An enclosure outside can be a money saving move. Many people also feel safer with the water heater outside, where if it leaks the chance of water damage is minimized. Often relocating a heater actually shortens the distance water needs to travel to fixtures and thus shortens the wait for hot water. Q. With energy prices going up double digit numbers can you suggest ways to conserve on our hot water heating? The most common ways that come to mind are: Change out that 3″ diameter shower head dad got for father’s day with a low flow model. Believe it or not some energy saving types actually clean soap off better than the old water guzzler while they conserve energy (or allow you to stay in the shower longer!). If you are the brave, “cheap” type you can turn the water off before putting conditioner in your hair and leave it off until you have soaped up. Turn the controls to the pilot position while gone on vacation or for any extended period of time. Try turning the temperature setting down little by little until it bothers you. A heater will save energy costs and last longer if it is fired up less. Flushing the heater periodically can keep sediment from building up and solidifying. Coral like sediment keeps the heat from transferring into the water as efficiently so over time more heat gets wasted up the chimney. Covering all exposed hot water piping, especially under your home with 3/4″ foam insulation will save energy and perhaps give you more usable hot water. Some people would suggest that you encourage your teenagers to move out but we wouldn’t dare do that. Q. At times I hear noises like water dripping into a hot skillet coming from my water heater; do I have a problem? A gas water heater uses approximately 10 parts of air for every part of gas to create complete combustion, and with that air comes moisture. The moisture can turn into droplets as it condensates going up a cold “chimney”. In short, that sizzling noise is normal at those times when you put high demand on your water heater and particularly when the heater is in a cold environment or on a brand new heater just fired up with a full tank of cold water. Q. There is a “gizmo” at the top of the heater (or in the hot water piping) which has a drain that expels water now and then; is that normal? That “gizmo” is probably your pressure and temperature relief valve. When it expels water we call it “popping off”. It typically has a setting of 150 lbs or 210 degrees Fahrenheit. This means that any higher pressure or temperature will open its spring loaded mechanism and release water thus making a safer situation for you. These valves are mandatory by law, without them you could get into a dangerous situation. It sounds like your relief valve is working to relieve either too high of pressure or temperature. Does your water seem too hot? Usually pressure is the issue. The most common situation like yours occurs when a home has a closed system; this means that once water comes into your house it is locked in. In some areas, especially in hilly areas water companies often give people at the bottom of a hill higher pressure in order to get an acceptable pressure at the top of the hill. Sometimes your water supplier raises the pressure to get more water for new construction in your area. Water loses almost 1/2 pound of pressure for every foot it goes up. In order for the people at the top of the hill to have 50lbs of pressure those at the bottom might have 100lbs? The legal limit is typically 80lb; many plumbing fixtures are not designed for any more than 80lbs and also a noise problem comes with higher pressure. So these homes and sometimes all homes in a community are required to have a pressure reducing valve, which as its name suggests takes water in at a “higher inlet pressure and reduces that pressure and maintains that lower pressure regardless of higher inlet pressures or increased demand”. This valve is what creates the “closed” system; once water goes through this valve it cannot go back out. The other factor that creates your valve expelling water (if you are still with me) is that water expands when heated and cannot be compressed. This means that if you have 50 gallons of water in your system at 45 degrees Fahrenheit and you heat it to 120 degrees Fahrenheit; it expands – it must go somewhere and if it can’t get out through the pressure reducing valve it must get out elsewhere. An expansion tank can help in this situation; and in some communities “air chambers” are required. The water expelled can be a nuisance; if so you might want a technician to see what can be done to stop your valve from “popping off”. Q. I occasionally notice what I imagine is a gas smell near the water heater but then at other times it is gone, should I be concerned? It is good to be very cautious with gas. If it is a constant or common smell I would be very concerned. You could call your gas supplier and they typically would check it out without any cost to you. If it occurs for just a minute or so just after the burner comes on it could be a normal occurrence. Natural gas is methane which requires an ideal burning situation to burn completely. As you might imagine it needs just the right amount of oxygen from the atmosphere and the correct amount of heat to burn completely. In a situation where the gas, air and temperature are not ideal you can get what we call incomplete combustion. If you have a gas range you have probably noticed this same smell for a few seconds after putting a pot full of cold water over a burner. On a water heater a burner disperses the gas and as the gas ignites it impinges on cold metal surfaces similar to the cold pot on the stove which don’t support complete combustion. Incomplete combustion translates into half burned gas which might include a little carbon monoxide (which is a good reason to never sleep in the same enclosed area as a gas burning appliance). When the burner comes on and the metal warms up the combustion becomes more complete and that smell disappears. The small hat type device sitting in the center on top of the heater is called the draft diverter; as its name implies, it diverts wind or drafts that might extinguish the pilot but it also functions as a means for the products of combustion (smoke) to escape into your room for the short period of time before the flue heats up and draws the products of combustion up and expels them outside of your home. If the draft diverter wasn’t there your products of combustion would likely extinguish your flame before the flue got warm enough to pull the gasses up and out. Q. Are drain pans under a water heater recommended? In some location sheet metal pans are required and in other situations they are highly recommended. You can guess the situations where water leakage could do the most damage. Water heaters located in interior closets or attics can become a nightmare. Too often we hear of a slow leak from either a pressure and temperature relief valve “popping off” or a tank failure going completely undetected until the day when someone notices hardwood flooring starting to buckle in the dining or bed room adjacent to the small closet with the water heater. We suggest thinking twice before going without a pan drained to a safe place outside the home. Q. What can I do when a new “fatter” energy saving water heater won’t fit in the space where my old one is now? This is the perfect time to relocate the new heater to an enclosure outside. Metal enclosures designed for the purpose are very handy ways to handle your situation and this gives you a free closet as a bonus. Q. I recently found out that our home water pressure is 90 lbs per square inch. Is this a good thing? Q. My new electric water heater keeps tripping the breaker, what is the problem? Newer electric water heaters often have larger heating elements which put more strain on old breakers. A new breaker is usually necessary to correct the situation. Q. Do I need a repair or a replacement if my gas heater isn’t producing hot water? How old the water heater is? How hard has it worked? Is it an energy saving model? Would I want to free up the area where it is now and relocate the water heater to an exterior closet? Was this heater the perfect size for us? Are children getting to the age where they want longer showers? Are children leaving home and now perhaps we might down size? Do we intend to live here much longer? What size might a prospective buyer of our home expect? Would we want to relocate the water heater, perhaps to a metal enclosure on the side or at the rear of the home to free up more space or to decrease the chance of future water damage in its present location? Would we want a metal pan under the water heater that drained to the outside? Would we be interested in a circulating system which would get hot water much sooner to that back shower or kitchen sink? Would a tank less, “on demand” type heater be a good choice for us? Would it make sense to change over from an electric heater to a gas heater? These are all considerations that you may want to address before choosing which heater will suit your needs best as a replacement. Reviewing our webpage FAQ will more than likely answer some of your questions and of course you are free to call and talk to our knowledgeable specialists at our toll free phone number above. One can also browse at www.Rheem.com for conventional heaters or www.Takagi.com for information regarding tank less, “on demand” units. Q. Do I need a repair or a replacement if my electric heater isn’t producing hot water? Electric elements are the most common item burning out on electric units and most people would not want to attempt changing their own. In areas where water less than ideal is supplied from your utility company, it is especially important to flush your heater periodically or the bottom element can easily become submerged in sediment leading to overheating and premature burning out. If your heater is leaking from the bottom it is time for a replacement. Considerations on sizing and type of heater are similar to those for gas units: see above. Energy saving is especially important with electric units since in most areas electric is more expensive than gas as a source of hot water. Does the inside of your water heater look like this? 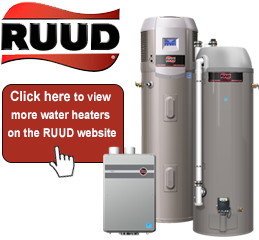 The most common household water heater is the 40 or 50 gallon gas or electric. With all of todays new technologies, there are a few options to choose from. If you click on the picture above you will be directed to RUUD's webpage. 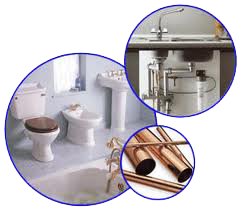 There you will find different types of water heaters. 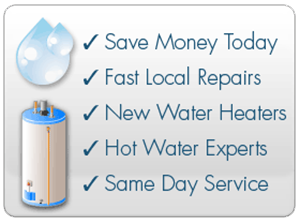 When you call for your free estimate, having the knowledge of the type and size water heater needed will assist us in giving you an accurate estimate.